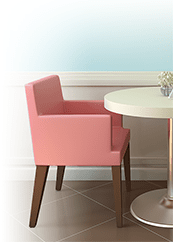 At RestaurantFurniture4Less.com, we offer the highest quality chairs, barstools, tables, waiting room, host station, patio and outdoor furniture at the best prices. Many of our products feature videos to give you more in depth descriptions and the virtual experience of touching, feeling and sitting on our chairs. We welcome your feedback about our site, products and your experience while shopping with Restaurant Furniture 4 Less. Please use our Customer Service form to send a note. Absolutely We're glad to take your order by phone. Call us toll-free at 1-855-307-3863. Our friendly and knowledgeable customer service representatives are happy to help you place your order and answer all your questions. Ensure that all charges, including sales tax and freight or shipping fees are included. Please contact Customer Service at 1-855-307-3863 to verify the total or if you're unsure of your state's sales tax rate. We try to accommodate requests for changes or cancellations if at all possible, as your satisfaction is our priority. Please call us at 1-855-307-3863 or use our Customer Service form to cancel an order. By placing an order on RestaurantFurniture4Less.com, you are agreeing that you have read and agree to our policies. All prices, specifications and availability on this web site are subject to change without notice. Although we make every effort to provide you the most accurate, up-to-date information, occasionally, one or more items on our web site may be inaccurately priced. In the event we receive an order with an incorrect price due to typographical, photographic, technical error or error in supplier pricing information, restaurantfurniture4less.com shall have the right to cancel or refuse the order. Restaurant Furniture 4 Less cannot be held responsible for supplying replacement product or issuing refunds for monitor/screen, printer or dye lot variances. THIS SITE IS PROVIDED BY RESTAURANT FURNITURE 4 LESS ON AN "AS IS" AND "AS AVAILABLE" BASIS. RESTAURANT FURNITURE 4 LESS MAKES NO REPRESENTATIONS OR WARRANTIES OF ANY KIND, EXPRESS OR IMPLIED, AS TO THE OPERATION OF THE RESTAURANT FURNITURE 4 LESS SITES OR THE INFORMATION, CONTENT, MATERIALS, OR PRODUCTS INCLUDED ON THE RESTAURANT FURNITURE 4 LESS SITES. TO THE FULL EXTENT PERMISSIBLE BY APPLICABLE LAW, RESTAURANT FURNITURE 4 LESS DISCLAIMS ALL WARRANTIES, EXPRESS OR IMPLIED, INCLUDING, BUT NOT LIMITED TO, IMPLIED WARRANTIES OF MERCHANTABILITY AND FITNESS FOR A PARTICULAR PURPOSE. WITHOUT LIMITING THE FOREGOING, RESTAURANT FURNITURE 4 LESS DISCLAIMS ANY AND ALL WARRANTIES, EXPRESS OR IMPLIED, FOR ANY MERCHANDISE OFFERED ON THE RESTAURANT FURNITURE 4 LESS SITES. YOU ACKNOWLEDGE, BY YOUR USE OF THE RESTAURANT FURNITURE 4 LESS SITES THAT YOUR USE OF THE RESTAURANT FURNITURE 4 LESS SITES IS AT YOUR SOLE RISK. THIS DISCLAIMER DOES NOT APPLY TO ANY PRODUCT WARRANTY OFFERED BY THE MANUFACTURER OF THE ITEM. THIS DISCLAIMER CONSTITUTES AN ESSENTIAL PART OF THIS AGREEMENT. SOME STATES DO NOT ALLOW LIMITATIONS ON HOW LONG AN IMPLIED WARRANTY LASTS, SO THE FOREGOING LIMITATIONS MAY NOT APPLY TO YOU.